A mountain stage? Certainly a mid-mountain stage with some awkward climbs and descents along the way including a difficult climb placed just before the finish. 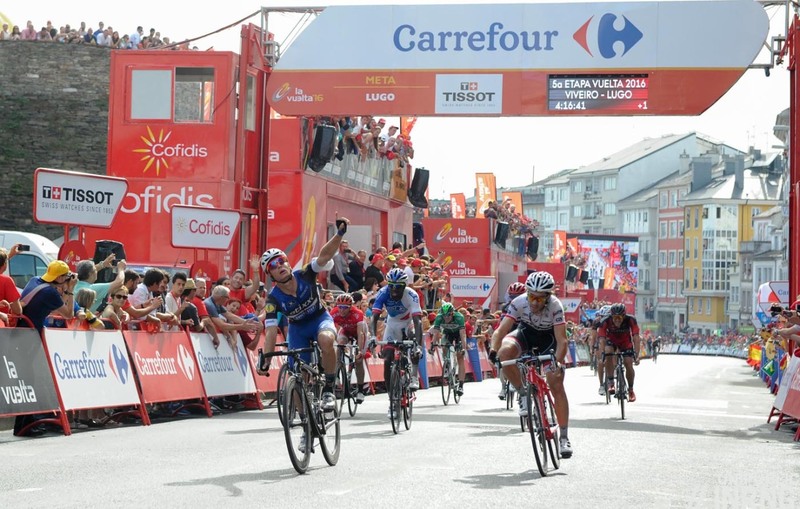 Stage 5 Wrap: a sprint win for Gianni Meersman, his second triumph. This time he was among the few left to contend the sprint after crashes split the bunch and caused many to fall. Worst off among the riders was Steven Kruijswijk who apparently collided with a bollard left in the road, an echo of Peter Stetina’s crash in the Tour of the Basque Country and there was a parked car on the other side of the road moments before too. Preventable? Yes and it doesn’t seem to be a matter of passing a UCI rule, just some common sense to have obstacles removed from the road or, if this is not possible, to have them marked and taped off so they do not form part of the route. Indeed a communiqué from the race said this was supposed to have been done in the first place. The Route: almost back to where the race begun in Ourense after 163km at nearly 3,000m of vertical gain. Things get going after the halfway point and the feedzone with a 7km at 4%, a warm-up for the climb with a sprint point just before the mountains point and 10km at 5% but with sustained parts at 6-7%. Then comes another unmarked climb at 4-5% but on a small, twisting road inside the Sil canyon and a reciprocal descent before another unmarked climb to Pombar where the road gets wider but not easier with 2km at nearly 8% to reach the 4km to go point. The Finish: a wide descent from Pombar down to Luintra with one tricky bend and then a sharp left-hander at the 1km to go point, a couple of hundred metres downhill and then finally the road rises gently up the the line. The Contenders: a breakaway or a sprint? Probably a breakaway although the irony is that for all the lack of sprint trains the route suits the few sprinters who started this race with Gianni Meersman, Niccolò Bonifazio able to cope with the climbs. The likes of Fabio Felline (Trek-Segafredo) and Giovanni Battaglin (Lotto-Jumbo) fare well on this kind of terrain too as they have a fast finish. Philippe Gilbert is looking strong and the sharp 2km climb with 4km to go climb is perfect for him but he’s been showing a lot of himself and there’s likely to be a queue on his wheel; all the more reason for him to boost his odds by going in the breakaway while Michał Kwiatkowski, Dries Devenyns and Moreno Moser can all win on a course like this but the latter two have just settled new contracts for next year so will they be in the mix? Nathan Haas (Dimension Data) is also a contender, he’s had a tendency to waste energy in the final phase of a race but his win in the Vuelta a Burgos was reassuring both for strategy and form. For fun, two random picks: Jhonatan Restrepo (Katusha) and Quentin Jauregui (Ag2r La Mondiale), both are strong, versatile and promising riders. Weather: hot humid and a strong chance of thunderstorms. The temperature will reach 34°C in the valleys. Looking at the pictures / GIF’s of the offending bollard, it was on the racing line as the riders swept round the prior RH curve. All the more odd that the bollard was seemingly not identified by the race organisers. Judging by the statements issued, they actually identified them but failed to mark them. Not sure which is worse. As a driver (not even someone in a bike race), I’d wish that bollard were bright orange or yellow or something to really make it stand out. On a more positive note; if the first 10 days or so of the Giro favoured the sprinters, the Vuelta’s offers rich pickings for the puncheurs. Although I wonder if we’ll see a similar exodus of riders on the first rest day? In fact, after reading Madiot’s concerns on the expanded WT calendar, the exodus phenomena could become a recurring theme? Off topic – sorry, but its important. IR correctly makes the point that the UCI has no direct or legal responsibility for safety on the course, this being down to the organizers. Maybe, but they are the governing body for the sport, more importantly the WT and have a moral if not legal responsibility for the standard of events run under their rules. The UCI should show some leadership by making it clear to organizers that they will not tolerate perfectly avoidable incidents as happened yesterday. A one meter high black steel post, on the racing line with less than two kilometers to the finish, where those following the wheels have little or no chance of seeing the obstruction until the last possible moment is simply unacceptable. The fact that the organizers have taken responsibility is simply not good enough. The incident was a perfectly predictable outcome and should never have happened. How many more avoidable life threatening incidents do the riders have to face, whilst the governing body simply says “not our responsibility”. It is not good enough. But when you say that the UCI should not tolerate these accidents, how would they threaten/punish the organisers? The UCI seems pretty powerless, particularly when it comes to the grand tours? If lotto or SK himself took legal action against aso for loss of earnings etc then this may prompt race organisers to take more responsibility. However i fear they will not want to ruffle any feathers so will say and do nothing. The course of races at this level are followed through several times from initial sketches to publicised route and I am certain this post – and probably more like it – were marked out for “this needs to be wrapped or softened” by the organiser. The right procedure – if the post was observed – would have been for the in front of the race driving race director to very quickly deploy a yellow flag and a whistle gesturing to the riders to narrow to the left while cornering. I don’t think there would have been time to have it wrapped in something. Obviously, the post was not observed until too late which was extremely unfortunate. Rest assured that the organiser has been told sharply that this is not good enough by the college of commissaires; he has, so to speak, been issued a yellow card. Indeed INRNG’s wrap concludes that this is the case. Good to read your input UHJ. There seems something all very “last minute” with the Vuelta. Remember the fiasco of the TTT route last year. It was known in advance but the problems were raised only a day or two prior to the start. I know the UCI are getting criticism (rightly or wrongly) but ASO / Unipublic again don’t seem to be preparing / administering well? As a former race organizer, I ask have the organizers truly taken responsibility here? It’s one thing to offer lip service to what was supposed to have happened, but another to step up to the plate with your wallet open. Will the organizers pay Kruijswick’s medical bills and compensate him for pain and suffering and potential loss of income? Who better than the organizers – after all, they select the parcourse – to safeguard avoidable obstacles and other manageable risks and to be held accountable for the same? And who the greater beneficiary of the race’s financial outcome, tv rights, etc.? The organizers or UCI? Furthermore, what governmental body sanctions the placement of vertical steel rods in the middle of a public roadway? Much less black ones? To me they appear inherently dangerous, to motorists and cyclists alike. These in Lugo appear designed to protect access (by prohibiting parking) to public trash bins so that they can be emptied by heavy equipment. Rather than dangerously invisible steel rods, why not public parking rules and signage enforced by significant fines and – for repeat offenders – car immobilizers or impoundment? I expect there may be a cultural element here, but the rule sphere seems soft all around (for race organizers and car parkers alike), unlike those steel rods. The UCI is never responsible. It seems that as long as the president is British some people will never accept any criticism of the UCI. What could the UCI do? A massive fine for the race organisers (would also get them some money from ASO). Dropping the race from next year’s WT (see how many teams turn up then). Have their own officials scrutinise the course. Had they done something after last year’s Basque Tour, this might not have happened. But – as in other cases, such as the moto problem – ‘nothing’ is the UCI’s response. Always talk; no action. People see the UCI as some omnipotent force but it’s a mid-sized governing body with a small HQ hidden behind a village retail park… this is not the IOC or FIFA. It doesn’t have the resources to walk the finish of every (pro) bike race to ensure security and, crucially, assume the legal/financial burden for this. It’s much more for the races and their people resolve and it’s here the UCI can help by aiding new rules that ensure safety, for example that the final 3km need a risk assessment and a race official has walk and then sign off the route on the day. Pax makes some very good points on two posts – one comparing how skiing does it – on the Stage 5 preview. The idea persists with some that there is nothing the UCI can do. But these are just excuses. Take out insurance, take the legal responsibility, charge these costs to race organisers and teams. This is far from the only safety issue where the UCI has taken no action. And the riders should stick up for themselves – refusing to ride today would be a start. I’m with Fourlegs. You just complain incessantly about the UCI. Never offer a realistic positive suggestion. Why not run for UCI president if you know so much and help the sport out. But in truth, ASO runs cycling so how is UCI going to threaten La Vuelta when its owned by ASO? There’s a few on here. They know everything and don’t always wear their knowledge lightly, that or they like nothing modern. Tbh it gets tedious sometimes. I made suggestions on this page – as did others. It’s worth bearing in mind, amongst the excuses made, that all that is required is someone to walk the final 5km of the course to check for dangers. That could be the UCI or they could make the race organisers do it. Which I now see is pretty much what the CPA are recommending. People don’t see the UCI as some omnipotent force, they seem them as a shower of shambling bureaucratic incompetents, who are far more concerned with keeping their jobs (hence the endless PR chatter) than doing said jobs well. Please give it a rest J Evans. Get involved in governance of cycling – give us some positives – the constant sniping at UCI is getting to be boring. I think Mr Ring has explained on a number of occasions that UCI does not have power or resources to do all that most of us would wish. This is not intended as personal critism and I hope for a positive response. If you run cycling you are responsible for cycling. It’s that simple. Yours is not a positive response. It offers nothing on cycling and is merely negative and personal (despite your claimed intentions). IR has explained and I, and others, disagree (I’ve given my reasons elsewhere on this page, so won’t add more). The reason for the ‘sniping’ at the UCI is that there is constantly something to complain about. And many, many others are doing so – on these pages and on others. Riders are being injured and killed and the authority does nothing. And some perenially make excuses for the authority. Thanks Fourlegs. It really get’s boring. Guess the UCI is responsible for 9/11 and WWII, and hides the Bernsteinzimmer too. That last paragraph of yours is a good idea. In principle, the president nor his “commanding officers” cannot manage given many routes run for 150+ kilometers and we have to with the race. But it could be fairly easy (sometimes it will not be but generally speaking) to mandate the finishing judge to do the walk through and assesment. I believe I will consider this for 2017 assignments to see if it can be done. Would be worth a try. Next event for me, though, is on a 6 km closed circuit so I expect nothing like “hidden posts” or other furniture. The obvious thing to do would be to drop the race from the world tour. The problem is the Vuelta (and the other big races) has a higher profile than the World Tour and it would do more damage to the UCI’s flagship series than the race. Also they’d run the risk of ASO taking umbrage and taking all their races put. So that leaves a big fine, or criminal negligence charges from the police against the organisor. Fine probably does not mean much. Criminal investigation may spur some into action though it is down to host country authority to decide to do that. That said, can UCI set up an independent body to sue race organisers for the peloton as a whole if something like this happens? Race organisers need to be sued, problem is by whom. Seems like this could be something taken up by the rider’s union. Maybe UCI should reserve some fund to help Rider’s Union do that. I’m sure I’ve aid this before but it bears repeating. It is exactly the same in Motor Rallying. The organisers appoint judges (equivalent to commissaires) with a senior judge appointed by FIA for International events. They drive round the course in front of the competitors and can advise on any action to be taken if they think it is dangerous but the responsibility lies entirely with the event organisers. If they feel it is excessively dangerous (usually where spectators are concerned) they can insist the stage is cancelled but that is their only recourse. I’m sure we’d love that. Hah. The same old people would be up in arms moaning about how riders are “big babies now” and “they don’t make them like they used to” and “rule 5” and so on and so forth. BenW. Everyone is entitled to express a view, whether you or I personally happen agree or not. Rather than belittling people’s contributions, maybe it would be better to try and make your own positive contribution to the blog. Better than adding little to the discussion, other than soft abuse. From what I am hearing, the riders representatives are repeating many of the views expressed here, so maybe some of the views being expressed are not so far of the mark. No one has claimed their view is correct, its called discussion and debate. If you really find the contributions ‘tedious’ you can always claim a refund and leave. With all due respect, I can and I do. Regularly. And I support this place through merchandise. I ask questions which INRNG takes time to answer, I voice opinions on what I’ve seen and what I think might happen that day, and so on and so forth. I don’t usually engage in slanging. I’m all for debate – the problem is, we don’t always have debates here. Whilst in the most part it’s civil and insightful, we have a handful of posters with strong and strident and seemingly intractable opinions who bellow over everyone else which can make it difficult; and it’s not just me who thinks this, as evidenced in past comment sections. Frequent post counts dont help, hallmarks of a stream of consciousness rather than a nuanced, considered discussion. It’s not a forum, after all. I’ve been here several years commenting, and for a little longer just as a reader. I’ve seen regular names who slowly drift off from posting and I’d be surprised if they were all due to changes in circumstances. This isn’t unique to INRNG by the way, it happens all over the internet. The Guardian in particular isn’t the place it used to be for the same reasons. And funnily enough, our antipodean cousins over at Cyclingtips see some of it too. Their comments can be hard reading sometimes as they have their own resident sniper and misery-guts. It’s all broadly similar. Addressing the above comment about “big babies” and so on, it was an attempt at humour; a joking, flippant response to Tovarishch’s ending “I’m sure we’d love that”. I’ve seen it before in F1 threads in particular – people clamour “something must be done” then when something is done and it’s not the outcome they’d like, it’s “oh they’re all such wimps now”. For instance, driving in the rain – You see the same people moan about the rain being dangerous due to accidents, moan that the rain is mitigated with a safety car, as well as moaning that the cars “basically drive themselves these days”. That’s all it was. And for the record, I have no issue with anything you’ve posted here. See the stage 7 preview for how anyone with a view that is not UK Cycling-friendly (and that includes anything Cookson/UCI-related) is shouted down. And in personal terms. Happens all the time – and yet these are the people who complain that others post too much and are too negative. I suspect a lot of people leave these pages because of that behaviour, rather than because of people who post about cycling, even if it is a bit too often for some tastes. Funny you mention Gilbert and Devenyns and the signing of new contracts ’cause they’ll be team mates next year at Etixx and there they’ll find Stybar who is also quite proficient at a route like this. A break away with those three in it could spark a fire today. To me it was a bit of an odd one Gilbert signing for Quick Step, an Ardennes/hilly classics specialist signing for a team that already has Martin, Alaphilippe, Stybar, Brambilla and Vakoc. Where will he fit in? I know he wants a last crack at the cobbles but they aren’t exactly short of options there either. Gilbert’s won all there is to win in the Ardennes and can become very popular by winning the Ronde, a win to help him cross the Flemish/Walloon divide. He’s been close in the race before but as you say he’s got to fit into a crowded team. I’ve been quite a fan of Gilbert, but him winning Flanders is fanciful to say the least. There’s little to indicate he’s capable of such a result now. It’ll work out I think. For the Ronde they basically have only two riders with the palmares, ambition and capabilities to rightfully claim leadership: Gilbert and Terpstra, with Stybar & Boonen as a ‘super subs’. In Roubaix Boonen and Gilbert switch places in the pecking order. For a team who makes the spring classics their single most important target of the year that’s not too much I’d say. Don’t forget both Stijn VDB and Tony Martin are leaving the team and young Yves Lampaert still has a lot to prove. I suppose Quick Steps problem during the spring classics this year was that whilst they had plenty of numbers in the last quarter of the races they had nobody who could follow Sagan’s explosive bursts on the key climbs. Gilbert in top condition is probably one of the few riders around who could potentially do that. The governing body should hold them accountable. Riders have to do something here. This is where the heads, people like Contador, Froome, Valverde, etc should be getting together and saying enough. Embarrass the organisers. Ride piano all day, no breakaways, no sprinting for the finish, no podium appearances. It’s the only way to get anything done: do something that threatens their financial situation. I tend to agree. Where does the CPA sit in this debate? If they’re role is to defend the basic rights of professional cyclists, why aren’t they more vocal, proactive and militant. For crying out loud, their members are dying and being maimed in crashes with motorbikes and street furniture. Why aren’t the patrons of the peloton equally vocal? A few, impotent tweets doesn’t cut it really. Quite simply because they’re not a powerful omnipotent presence too. You may recall the problems in Tirreno-Adriatico this year, when Astana / Nibali got into a spat with the CPA. I think it’s ENRICO Battaglin in this race for Lotto-Jumbo, I think Giovanni’s a bit old these days for racing at this level.